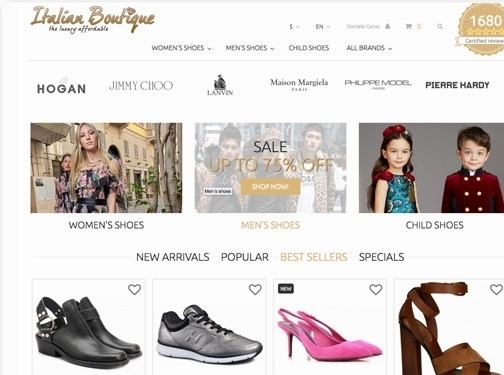 At Italian-Boutique.com you fill find a wide choice of best luxury designer shoes at outlet price discounted from 30% to 70% from italian retail price. All shoes are immediatelly available shipped in 24h all over the world. Our store is organized by designers and type of shoes: you can shop by brands following the burgrundy bar on top or select a category on the left and then filter the results by size or designer. Payment is easy and fast: you don't need to register if you have a social account or pay immediatelly with PayPal Express checkout. Credit cards are also accepted. Shipping will be done by express courier like FedEx, DHL or UPS in 24h tracked around the world. Delivery in 2/4 working days. Italian (Firenze) based company providing shoes and handbags for sale. Website includes e-commerce facilities, delivery and returns information, FAQs, size chart, terms and conditions, associations, testimonials, full company contact details.